Combined Standard Electrophysiology of vision within the most advanced test for the early functional diagnosis of important pathologies like Glaucoma and ARM (age related maculopaty). 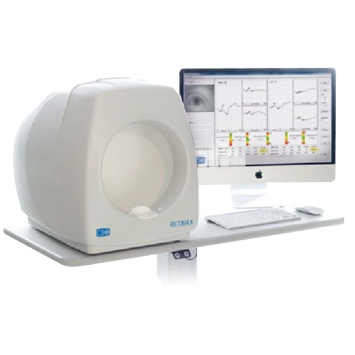 Thanks to the new technologies employed, Retimax allows to detect dysfunction within 20-40 degree of area in the retina structure in a very early stage before perimetric abnormalities in the visual field can reveal. Interpretation of results is now fast and easy thanks to the comparison of the test with internal normative database.